Candy Crush teaches me nothing and steals my time and money. I can’t stop playing it. This candy’s laced with crack. In the last 10 days, I’ve spent $21, repeatedly drained my phone battery, and blown a deadline for the first time in years—all so I could play a game for which I have absolutely no aptitude. I’ve been tapping away at Candy Crush Saga on the subway (like half of New York), in front of the television, and, yes, in the bathroom for countless hours, and despite all that expense and devotion, I’m stuck at Level 38. There are more than 350 levels. My Slate colleague Rachael Larimore, a mother of three and the most sensible person I know, has reached Level 125. I’m 10 times more irresponsible than Rachael, but about three times less successful at a dumb phone game. That’s just not right. I’m not alone in my addiction. About 45 million people play Candy Crush on Facebook each month, making it the most popular game on the site. It’s the most downloaded mobile game on both Android and Apple devices, and it’s the top-grossing mobile app. Think Gaming estimates that Candy Crush brings in around $633,000 a day—more than $230 million a year—for King, its British creator. Candy Crush is simultaneously simple and satanic. Faced with a grid full of brightly colored “candies,” players must move around the pieces to line up three of the same type in a row; once aligned, the candies—crushed—disappear, and those above them take their place. It’s Bejeweled meets Tetris, a veritable speedball of a puzzle game. There are a few complications involving fruits, nuts, and jelly. (After a handful of easy rounds, the bonbons start to become encased in the stuff.) But that’s pretty much all there is to it. All those hundreds of levels represent different challenges—points targets, number of moves permitted—but the game play itself remains the same: Line up at least three candies of the same color, click, and repeat until you’re weeping from frustration. It’s that straightforwardness that makes it so addictive. 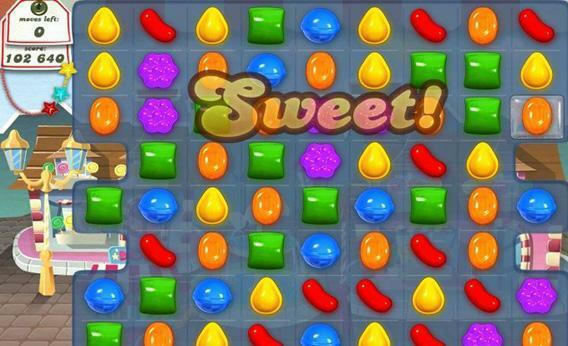 Candy Crush is a particularly fiendish example of “freemium” software. There’s no initial charge to download the app or to start the game, but just as you start to experience pride in your chain-building skills and feel the thrill of accomplishment, the learning curve stalls. You discover that we all have but five lives to give in the quest to crush candy, and if you use them all up before clearing a level, you’re locked out of the game for 30 minutes before you can try again. Wait 30 minutes, lose that life, and you have to wait for 30 more. I mostly play on my phone and tablet, and if you happen to have two devices, you can postpone the inevitable wait by switching from one to the other. Or you can cough up 99 cents to buy more lives so that you can carry on playing. You know, while you have the hot hand. The mobile experience of Candy Crush is refreshingly self-sufficient. There’s no prize in this game beyond the satisfaction of suspecting that your cherry-shifting skills are superior to those of all the other Toms, Dicks, and Harrys—or, more likely, since casual games are most popular with women, Tracys, Deborahs, and Henriettas—who are struggling with Level 34. On Facebook, however, it’s a crusher-vs.-crusher competition, all in the service of promoting the game. Even if you manage to avoid flooding your timeline with news of your Candy Crush prowess, as you progress through the various levels, you’re shown how your scores compare with those of your friends. I imagine this is meant as a sort of giddy-up: “Come on, June, you’re already more skillful than Jemima; keep playing, and you’ll one day best Jodi.” Instead, it filled me with shame and guilt. After an early round, a message popped up: “Congratulations, you beat Joan.” Joan’s profile picture showed her holding up a sign extolling world peace. It was as if I were Mars himself, ripping up Joan’s sign and showering her with the tiny fragments as she wept in horror. More intrusively, at certain points—starting at Level 20—you can’t progress further without asking friends for a “ticket” (or by paying for Facebook credits). Level 20 marked the end of my Candy Crush campaign on Facebook. The truth is, my interest in the game is already waning. A few days ago, the candies started to look ridiculous. Why on Earth would anyone put one of those fluorescent blue balls in their mouth? (Officially, they’re lollipop heads. Which doesn’t change a thing as far as I’m concerned.) Then its odd Englishness began to bug. “Wow, splendid days,” a strange, floating, monocle-wearing head declared when I cleared a level. The Founding Fathers didn’t dump jellybeans and jawbreakers into Boston Harbor so that 240 years later we could send millions of dollars to a British King for in-app purchases. The biggest problem, though, is that I have no talent for pattern recognition. Back in the days when everyone was crazy for Angry Birds, you could at least watch YouTube videos to learn the best ways to kill the pigs. The stratagem for conquering Candy Crush is no more complicated than “make long links and don’t get sidetracked.” There’s nothing to learn. Just like real candy, the game offers empty calories with no nutritional value. I now feel about Candy Crush the way a kid feels about chocolate the morning after Halloween: I never, ever want to touch it again. At least not for a day or two.